Nestled between two high ridges in the heart of the Vredefort Dome World Heritage Site, Deelfontein offers activities ranging from hiking, trail running and mountain biking to birdwatching and stargazing. Experience peace and quiet in the seclusion of this pristine mountain area only 140 km from Johannesburg. 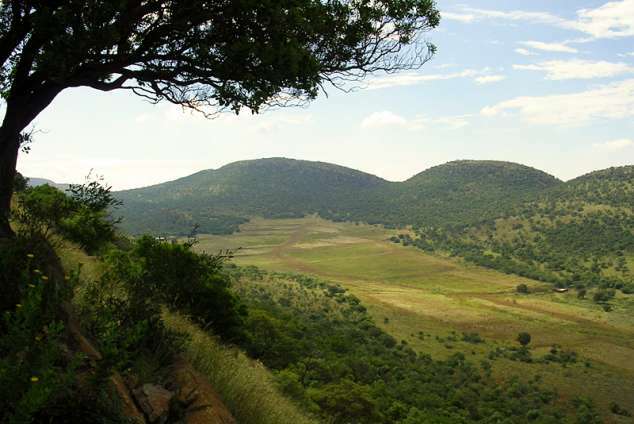 The vicinity boasts a unique geology, as the largest and oldest meteorite impact structure on earth, an abundance of naturally occurring insect-, bird- and wildlife, and diverse plant communities drawing upon bushveld, highveld and even fynbos biotopes. Accommodation is offered in two self-catering guest houses, a rondavel, and a bush camp. The facilities are developed to minimise ecological impact, extending to aspects such as visual and noise impact and water and energy conservation. To achieve these aims, roofing structures are greened whenever possible, a gradual switch to solar and wind power is under way, and waterless composting toilets, using technology developed in Germany, are used in all the buildings. Two farm houses, approximately 300 m apart, provide comfortable self-catering accommodation for 11 and 16 persons respectively, and offer electricity, a fully equipped kitchen, single and double bedrooms with bedding, and an outdoor barbeque area each. Two large seminar rooms and a third barbeque area allow for functions and seminars. No television, cell phone reception, cleaning service, and firewood. Ideal for families and groups. A thatched rondavel with with living room, kitchen with gas stove and bar fridge, bathroom with shower, and a double bed on a mezzanine overlooking living room offers rustic accommodation for couples. Mains electricity supplied. Barbeque facility on lawn under a large shade tree. Three traditional thatched stone-and-mud huts, a lapa, and toilet facilities comprise the bush camp, situated between indigenous trees and shrubs. Bunk beds with mattresses for 16 persons, electrical lighting, a gas stove , and hot water supplied by two donkeys provide all comforts for those who want to rough it smoothly. Crockery and cutlery are provided as well as pots and pans, but no television, cell phone reception, cleaning service, firewood, toilet paper, matches, dishwashing liquid and bedding. A pool offers welcome relief after hiking. Cool down in the 15 m swimming pool and explore the area on a number of shorter and longer hiking trails. The Meteorite Hiking Trail offers overnight hiking. About 20 km of exciting MTB single track trails await the avid biker. The Dome is a birdwatchers paradise, and the trails lead to various habitats, ideal for the birding enthusiast. Making the most of the Dome's dark night sky, stargazing is possible in the equipped observatory. (Prior booking essential.) In the near vicinity, horse riding, fly fishing, white river rafting, and other adventure activities are possible. No mobile phone reception, hence no telephonic assistance if you get lost! left. The campsite is 200 m further. Please close all gates! further. For the bush camp, continue for 1 km until the road forks. Keep left. The campsite is 200 m further. Please close all gates! Caltex garage). After 1 km, there is a crossing with the Viljoenskroon road. from the north above from Parys. 27501 page views since 21 Jun, 2010. Last updated on 13 Jun, 2018.